Heat pumps are reversible air conditioning systems. In hot weather, heat pumps as air conditioners absorb heat inside a building and discharge it outside. With cold winter temperatures, heat pumps absorb heat outside the building and release it inside. When outside temperatures drop too low to allow the heat pump to extract heat from the frigid air, some systems switch on a backup heating system to supply the rest of the heat needed to reach the desired temperature inside. While some heat pumps have that auxiliary heating capability, others do not. Several differences exist between a heat pump with auxiliary heat features and a heat pump without auxiliary heat. First, systems with auxiliary heat have another section to the air-exchanger plenum right after the interior heat pump condenser. This section usually has a electric resistance heating coils or finned electric heating elements, but it is also possible to purchase a heat pump with an oil furnace backup. They are turned on whenever the heat pump control system senses that it is not receiving enough heat from outside to bring the inside space to the desired temperature. Systems without auxiliary heat do not include this heating section, nor the extra sensing circuitry to turn it on. Also, the auxiliary heat enabling switch is not included in the wall thermostat that controls that kind of heat pump system. For those reasons, heat pumps without auxiliary heat tend to be sold in climate zones that occasionally experience very mild winter conditions with temperatures never going below about 35 degrees F.
A window air conditioner physically reversed in the window is effectively what happens when the heat pump system is switched from cooling to heating. Upon switching, a four-way cross-valve exactly exchanges the condenser and evaporator section functions of the heat pump. Then the system absorbs the heat from outside air and makes it available inside the house via the refrigerant cycle. 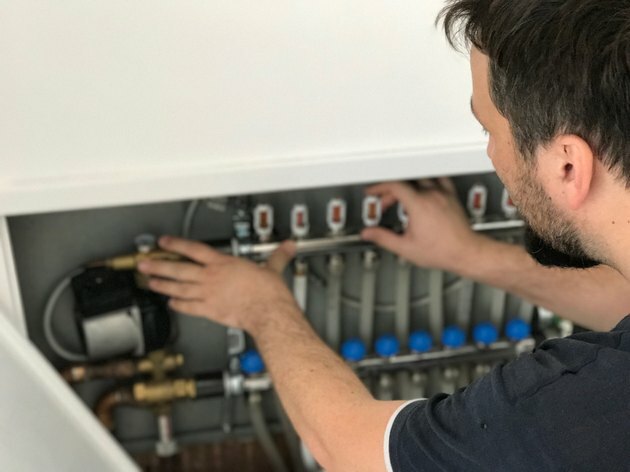 Heat pumps, used as either air conditioners or heating units, have a certain capacity to establish a maximum delta T, or maximum difference between inside and outside temperature of about 30 degrees F either way. Therefore, in the heating mode, about the coldest it can be outside is about 35 degrees F. Below this point, the system efficiency drops dramatically, and it needs to find the additional heat another way. So it switches in the auxiliary heat. A system without auxiliary heat leaves it up to the building's occupant to figure out how to obtain more heat. Most early heat pump systems augmented the reversed-refrigerant cycle heating with resistance electrical heating coils in the air handler. Resistance electrical heating is not particularly efficient, however, so as energy became more costly, other auxiliary heat options were sought. Instead of resistance heating coils, some systems provide electrical control output signals that can send commands to other heating systems in the building to switch on. These systems can be geothermal, heating oil, or natural gas depending on what is optimal for the geographic area. No-frills heat pump systems without the auxiliary heat capability sometimes make that feature an add-later option. Because consumers have many more auxiliary heat options to work with for augmenting heat pumps, this allows them to experience a winter or two in a milder climate zone without the feature before committing to the extra investment, whichever one it may be. Can I Put a Refrigerator in an Unheated Garage?